Confront terrors both known and unknown in a explosive battle for survival with F.E.A.R 2: Project Origin for PC. This action-packed follow-up to Monolith Productions's award-winning supernatural shooter F.E.A.R. begins where the previous game left off. This time, you'll come up against Alma's powers from the perspective of special forces operator Michael Becket. After an enormous explosion has devastated the city of Auburn, you'll quickly discover that what seemed like an ordinary mission to retrieve and interrogate Genevieve Aristide is anything but. Ghoulish supernatural enemies give F.E.A.R. 2: Project Origin a horrific, cinematic feel. View larger. You'll explore and do battle in the dark corners of the ruined city of Auburn. View larger. An enhanced graphics engine offers more dramatic effects. View larger. Improved enemy AI means you'll need better tactics. View larger. Fans of the first game will be familiar with the suspenseful story surrounding the psychic Alma, a peculiar and disturbing odyssey that adds depth to her devastating quest for revenge and immediacy to gameplay. Origin began as a secret military project run by the Aramacham Technology Corporation (ATC) . In an experiment run by Alma's own father, her DNA was used to create two clones that possessed her impressive psychic powers in an attempt to engineer a telepathic military commander. In the end, the research team became worried about the dangers of Alma's powers, and they tried to kill her. While her heart stopped beating and her physical body died, her psychic energy continued to exist, and she manifested herself in many forms, including both a child and a deformed adult figure that betrays the gruesomeness of her ordeal. Due to a string of events tied to both her clones, Alma has escaped the disastrous explosion of the last game and the facility where she was held, and the haunting manifestations of her power are at work all around you, adding an unpredictable, nightmarish quality to the world. In order to get anywhere in the rubble of the city of Auburn, you'll need to survive firefights, stay calm in the face of surprisingly graphic events, and uncover the terrifying and mysterious nature of your real enemies. Your character's phenomenal reflexes allow the much-talked-about slow motion effect from the original title to persist here, giving you an edge in combat and adding to the unique nature of your perspective. An enhanced graphics engine means more detailed environments to explore and better effects. The vast destruction in the city opens up a huge variety of spaces and enhances the other-worldly feel of your mission, and you better be ready to stay on guard because all-new enemies powered by improved AI don't just act more realistically than their predecessors, they employ advanced combat tactics and know how to use the environment against you. But they aren't the only ones with more resources at their disposal--additional world interaction enhancements allow you to create cover and protect yourself or remove obstacles from your path. While it may be the horrific action and the details that first catch your eye, the tactical demands and the way story elements are slowly unveiled promise to help keep you interested as gameplay wears on. And for those times when you're not in the mood for a prolonged single-player campaign, this title also offers the ability to battle with or against friends in multiplayer mode. First of all, the game requires Steam, so for those that have problems with that or would like to be able to lend or resell their game, stay away. I would not have bought the game, had I known this. Lesson learned; now I check the DRM scheme of every game before bying it. The game itself is not as good as the original. A lot of the options of the original are gone, like leaning or joystick support. It is also a lot more action focused. In contrast with the original, your character very rarely has the jump on the enemies, it is usually more the case that the enemies magically know where you are and just storm you without warning. The metaphysical parts and gotcha moments are also a bit too much for my taste. Not quite sure how I can kill ghosts with bullets either. Scary and Amazing at the same time! I thought the game sucked. It was about 20-30 hours of gameplay, not very challenging or imaginative. Very linear. This was simply a game drop to play on a immense success of the prior FEAR's. If you must play, wait a month, the price will drop fast. For some reason, the majority of sequel games tend to pale in comparison to the original with Diablo 2 being really the only exception. game play - was good, it seemed a little stretched probably because of the 2 expansions for the first FEAR. It centers around project HARBINGER, a project to take already psychic people and use manipulation to make their powers better. They started project HARBINGER after Paxton Fettel of project ORIGIN went insane and tried to kill everyone. Sniper - oh, this was a beautiful weapon. 10 shot clip, head shot makes the body explode...it was beautiful. Laser - same as the first except that the zoom isn't a scope with a distance meter, but it does have a laser system. Napalm cannon - fun but still kinda lame, it only shoots a single shot (you can't really stream it) but it only has 10 shots per load so it's not too bad. It sets them on fire but the fire will go out if you only shot them once but shoot them about 3 - 4 times and they'll go down. Energy gun - wow...good gun but a complete rip off of the BFG2000 from Doom. blue ball flies and disintegrates everyone it passes. Grenades - there are like 5 different grenades; frag, smoke, EMP, incendiary & proximity mines. there are also armored vehicles which have turrets (probably .50 cal or something like that) but they are fun and great for mowing down all the guys that seem to come out of the wood work. but the best thing in the game...remember those big, mechanical armored units? well, there are now two, the ones from the first games and then the same one on steroids. The latter about about 2x as big and packs more of a punch...the fun part, you get to drive it, twice. they are AWESOME!!!! guns, rockets and infrared vision, the only downside is the guns over heat. enemies - specially trained security detail, replicas, the invisible dudes, insane genetically altered people (kinda tough at first but then you get to where you know their movements...they're a little predictable) and that's about it...just waves and waves of them. I also had been waiting for this to come to PC for some time. I grabbed it right off the bat. As soon as I started installing it, I got a feeling of dread. "STEAM"!!! I hate Steam products. I hate their policies and the software requirements. I think it was deliberately NOT placed on the box. I never buy pirated games and I feel I should be able to sell my game to anyone any time. "Anything to make a buck" means people will not buy the next product my friends. I still like MONILITH a lot and why can't they do an updated version of NOLF (No One Lives Forever)? Controls are without issues except the same complaint that there is no lean?? Weapons are pretty well placed and get better through the game. Even on Normal mode I was able to pretty well take everyone out. Using a MECH was pretty cool. It is WAY linear which give ZERO replay value. Awards for completing stuff is a bad way to get us to replay. Sometimes I might play a game 3-4 times and then use cheats just to have fun in single player game. There's no developer console?? AI is pretty dumb. Most likely since it's so linear, they have very little ways to flank you (or you flank them) which takes the fun/skill out of it. It seemed like the story was thrown together. Not the best acting. First of all this game requires Steam to play. It's not the first and won't be the last. Like most intelligent, rational people realize, everything has pros and cons, including Steam... although some are never satisfied if everything isn't exactly their way. Oh well. Times change, but you don't have to. Project Origin is the action-packed sequel to the celebrated FPS/Horror game FEAR. It should be noted that the storylines in the 2 expansion packs are thrown out the window. As far as action goes it is a worthy sequel in just about every way, and while the story is not quite as engaging, it is still pretty interesting, sinister and creepy. -Sharp presentation and great atmosphere featuring levels with much more variation this time around. Combat is fun and the pseudo cover system adds a bit more to the action allowing you to push over and manipulate objects to crouch behind. -Among the best exaggerated video game blood/gore visuals to date and some of the more disturbing scenes will stay with you long after you finish the game. It is worth pointing out specifically that the blood splatter in this game looks great. -Up close, visceral combat sequences are as awesome as ever with familiar slow motion to help you cleanly take out foes in otherwise difficult situations. Melee combat is also back and still quite fun, but isn't as powerful as before. -The framerate is blazing. Most relatively new systems will be able to crank everything up and experience silky smooth gameplay. -Incredibly immersive. When pressing buttons and manipulating objects & switches you will see your character reach out to move, slide, push, turn... you name it, including nice animations when vaulting over rails and some tables/surfaces. -Control is flawless. This game plays great and handles as tight as any FPS game. -The user-interface is fun, effective and easy to use to select weapons and grenades, just hold the button to bring it up, point and release, or you can tap the button to select the last weapon used. Also this time around you can carry 4 firearms. -"Cookable" grenades and punchy iron-site weapons are awesome and fun to use. Some of my personal least-favorite cons associated with FEAR 2 for PC are (predictably) related to a greater emphasis on console releases by the developers. -Lack of mouse button 4 and 5 support and no gamepad support. -"Letterboxing". Meaning that regardless of resolution, the aspect ratio is locked at 16x9 and most monitors (including widescreen) will display black bars above and below the game screen. -Checkpoint save system and no walk button. -Gameplay can feel somewhat simplistic and no lean feature. -A bit on the stereotypical side, too. Most of the scares and creepy visuals stem from heavy post-processing effects and sound. The frequent creepy visages will more than likely just make you think "Oh, that looks cool..." rather than provide any real scares or tension. But some of the sequences are eye-popping and may shock you visually, which makes them quite effective in that sense. -Film grain looks excessive on LCD monitors (although again, there have been claims this can be removed after a future patch if you so choose), real time shadows are not used very much and some light source effects look pretty archaic. -Aforementioned story elements are not engaging and quite bland, mainly due to to how some of them are delivered. You find "intelligence items" lying around like PDAs, disks and electronic notices that once interacted with the action pauses, the ambiance is silenced, and you read through it. Not very exciting. Despite its flaws, this game is easy to recommend to die hard FPS fans. If you enjoy FPS and horror games, you will appreciate the addictive action and the very cool horror sequences that FEAR 2 has to offer. Even though a lack of some PC-specific details may be a bit bothersome, it is nonetheless a well-polished game overall. Just got home to try this game. Steam servers down. They have a "live" server status page on the troubleshooting section. I CAN NOT PLAY A GAME I PAID FOR. Finished in a day and a half on normal. I truly did like the first installment of the series, quite innovating gaming style, good storyline and really scary... if you like scary games, pumped with action this was your title. Then came the "expansions" which didn't truly add anything to the story but where quite good, specially the first one. Now, about this new installment. They changed the interface and a little bit the "slow mo" mode, but still is quite good. Alma shows a new side of herself, she is quite more.... interactive with the player, and of course there are new enemies, more scary moments, action pumped scenes and good but not enough, mechas... or combat armors. The system for the combat armor is great, but they didn't last that much. Graphics are quite nice, and runs pretty cool, on my system. Sound... oh well, sometimes too low, you can barely here what other people (in the game) is saying. About difficulty, was between easy and moderate, on normal, hard enough to challenge a newbee, but I would recommend Hard for a FPS maniac. The game took around 10 hours... maybe, to beat on normal difficulty. Haven't tried multiplayer but I will sometime soon. The games is quite open ended, so I hope they will bring something new and add some more to the already twisted enough story. right now the game is totally messed up....it has issues with loading different intervals and numerous sound related issues as well. Please check out the forums on this game before you buy. First off its attached at the hip to STEAM so getting tech support and issue resolution is nigh near impossible. Secondly, the retail versions seem to be missing necessary pieces of code which aren't there and who knows when it will be there. The game overall appears to be really good and I would have given it a higher score except for the all the issues which bring this puppy in at a very weak 1. WAIT FOR IT TO BE PATCHED or you will be very disappointed. A revamp, but a polished and entertaining revamp. A retread of the original FEAR than maintains the ambiance and lore of the original, but refines gameplay and storytelling, whilst dressing the product in a finely polished wrap. Certainly the best FPS I have played this year and well worth a look. Stability: I had no troubles with running the game other than some recurrent issues with STEAM. SLI worked out of the box with no trouble and the game ran maxed out on twin 8800GTs with high frame rate and excellent stability. Also had no trouble running on Vista 64 bit. The occasionally CTD was caused by STEAM not have downloaded the files correctly, and was resolved by having STEAM recheck and re-download them. This was caused in certain levels and caused a CTD. I am not going to pin this on the game too much since this is a STEAM issue - cost me quite a bit of time trying to figure out the problem though. It is reportedly possible to install and run this game without steam (re: Internet), and doing so may well be worth your time. Graphics: The original FEAR was never the best looker around and is now very dated. The new FEAR is a stellar presentation, improved even further by removing the 'film grain' option from the graphics menu(in the same way as the original). It's an indoor corridor shooter and so all of the situations are interiors (or enclosed and restricted exteriors), but they mix it up with lavish detail on all the environments and a number of different sets and villains in a way that prevented me from feeling that it was repetitive. Smoke and water effects are very nicely done in particular and the lighting is just superb. I run the game in 16:10 widescreen and once patched worked perfectly. The only exception to this is that you need to select the resolution (1680X1050 in my case) and leave the widescreen option unchecked in order to get the correct aspect ratio (and eliminate the black bars). This aside, presentation is a highlight and reminded me a lot of Quake 4 in feel and appearance (a highly underrated game IMO). The only real downer with the presentation is that the environment is not as destructible as the original and objects feel like they are made of concrete, rather than having lifelike physics. Sound: In many ways it is the sound and music that makes FEAR the game that it is. With a lesser soundtrack this game could potential be labelled as derivative. The horror effects and soundtrack are retained from previous offerings and for most of the time fit the part. 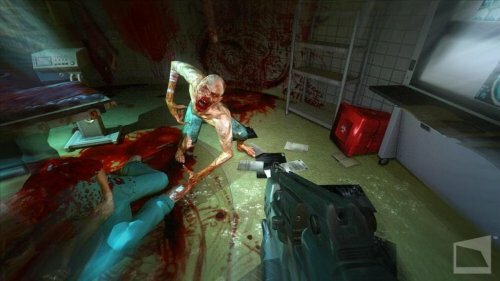 The sound lacks any advanced EAX support of effects that a PC is capable of, and this is no doubt due to its console origins, but nevertheless its surround sound and positional effects that are so necessary for shooters and for the horror genre in particular are easily the best part of the game. Gameplay & Story: Despite the games console origins and the loss of the lean options (something that I always felt was lame anyway - like you can fire a gun accuratelty on full auto leaning!) the game still felt very much like a PC shooter. Some aspects of play didn't work particularly well such as the movable furniture, and the melee combat was somewhat reduced, but nevertheless the game was highly entertaining and has an improved feel over the original yet retains its basic lore and atmosphere. After playing this game through the first time I went back and replayed the first FEAR and came to realise that the gameplay has improved in a number of areas. Looking back on it now the original FEAR has dated badly - though it was great fun in its day. There are a number of improvements in this game. Firstly the environments are better fleshed out and graphics and presentation are a vast improvement. Also the story telling has picked up in method and variety. In the first, the game as told largely via recorded phone messages whereas in this game the story is picked up from intel messages left around and also interaction with LT Stokes and a small team (¨¤ la Quake 4). It is not a self contained story like the first but rather uses the lore from the first game and improves on the story in this game. I found the story here and the pacing of the game as well as the improved presentation to be refreshing and very polished. There is nothing original here though, it is simply well paced out and put together which made for an entertaining and exciting experience. The game doesn't used save points typical of most PC games in the FPS genre however they are varied sufficiently that I never found this an issue. Dying did not result in me having to go back and replay large sections of the game but merely the last battle (e.g. the one that I died in). I found this to be fair and honestly I would have found a save setup to be akin to cheating, so I was happy with this, though I recognize that some will not. The original Far Cry had this as do many PC shooters but in this case it is well implemented. Some of the weapons were not really balanced properly and were largely ineffective. In particular the pistol, shotgun and the napalm cannon - while spectacular on occasion - were largely useless and you were better off putting other weapons in your four available slots. The AI was never spectacular in the original, ( I don't think any game has ever got better of the half-life 1 standards) and this is more or less repeated here. Nevertheless I was killed by flanking manoeuvres a similar number of times to the original, so no real change here. I like the story and even the ending for once, which is something of a refreshing change. It reminded me a lot of Quake 4 in feel, but nevertheless it retained the ambiance and sentiment of the first. Replayability: I bought it and played it through twice almost straight away. It started to get a little old at the end of the second round but the game lasts about 10 hours first through which is acceptable in my opinion but lacks and co-op mode to extend it even more. Multi-player adds some extra time for you money but I didn't play this too much and there is better on offer in the MP department from what I can tell. Saying that, I don't play MP much so your experience may be different. Verdict: For originality it gets a 2.5. It loses a whole point for the STEAM requirement (I personally hate STEAM) but for fun I give it a 5. They have successfully made a sequel that retains the spookiness and horror from the first installation with a very polished hybrid quake 4/half life 2 feel experience that makes for a blast. Just don't expect anything terribly new. I have played all the top First Person Shooter games in the past 10 years. Based on the original FEAR, I was really looking forward to this game as soon as I heard it was coming out. However, reading the reviews got me worried. I'm not talking about the people who write the 1-star reviews because of the need for Steam or some other program/system. They will always tear down a game because of that no matter how good it is. I had to use it for Half Life 2 and a couple other games and have never had a problem with it. If you're a real gamer, and you know a game's going to require Steam, why do you buy it in the first place? Is it just so you can complain about it? I'm talking about the people who gave the game bad reviews based on its content. I have to say, though, that I love it. It has great graphics, a neat variety of weapons, and the ability to slow time you can improve over the course of the game. I can't wait for FEAR 3! I wrote my initial review when I was just starting the game, and I have to say that finishing it did nothing to change my mind about how good it is. As far as the comments I got, you know, I talked about Steam because I'm really sick and tired of people ripping a game based solely on that. They don't talk about the quality of the game, just how lousy they think it is to have to download Steam. I understand if the game won't run on someone's computer, but that's a technical issue I can't comment on with any authority. I just know I haven't had any problems with my three and a half year old computer. Quite frankly, the Steam thing is old news, and it's likely the same people making the comment over and over again. All I can say is please get past it already and talk about the game for a change. You have to evaluate the whole package. And about why I said I can't wait for FEAR 3, it's because I don't buy expansion packs. As far as I'm concerned, they're not a new story, so I don't waste my money on them. As much as I liked Half Life 2, I didn't buy the expansion packs for it. I know why expansions are put out, but I've never been into them. Play the Demo first. It's free.